MOSCOW, Russia -- Russian Prime Minister Vladimir Putin flies into Kiev on Monday as the Ukrainian parliament's prepares to consider ratifying the deal on Russia's naval base in Crimea in a vote of no little importance to Moscow. Russian fleet in Sevastopol, Ukraine. Russia's parliament will also consider the agreement on Tuesday, but there will be no fireworks in the State Duma. Ukraine's Supreme Rada might be a different proposition. The government says it has the votes, but the extension to the lease will be fiercely fought by the opposition, led by ex-prime minister and losing presidential candidate Yulia Tymoshenko and former President Viktor Yushchenko - united again, at least on this, after years of bitterness once the shine had worn off their orange revolution. Before President Viktor Yanukovych beat Tymoshenko in February's runoff to replace Yushchenko, there was no discussion of extending the lease - Yushchenko had told Russia to prepare to leave in 2017. But times change, and although the makeup of parliament didn't, enough lawmakers voted for Yanukovych's prime minister after booting out Tymoshenko and her Cabinet. So the ruling coalition relies on the votes of members of the previous broadly nationalist parliamentary majority, and the Rada will now have to consider the question: what is Ukraine's sovereignty worth? The basics of the deal have been well-reported - for Russia, an extra 25 years at the Black Sea Fleet's main Sevastopol base, and for Ukraine, a 30% discount on Russian gas until 2020, when the current contract expires. The discount will cost Russia an estimated $3 or $4 billion a year at current prices. And after 2017, it will reportedly be offset by comparable cuts in the new, higher rent for the naval facilities Russia uses in Crimea. Russian President Dmitry Medvedev said the Black Sea Fleet base and the gas contract were only technically linked, and the deal was purely financial. "The discount will be applied against Russia's rent for the deployment of its Black Sea Fleet and the naval base in Sevastopol. This is a technical, rather than political link, and involves a financial transaction only," he said. The economics of the deal have already been touted in Ukraine. National energy company Naftogaz says the deal will prevent it from going bankrupt, and given the prices consumers pay - or in many cases fail to pay - for the gas it buys from Russia, there is little reason to doubt that this is the case. It is news each month when Gazprom receives its money on time and in full, as it has since the Tymoshenko and Putin ended the gas standoff between the two countries in January 2009. But despite the undoubted economic importance to Ukraine, this is, of course, much much more than a financial transaction. It will set a marker for how far the administration of Ukrainian President Viktor Yanukovych can go in moving Kiev closer to Moscow. Elected almost exclusively due to strong support in the mostly Russian-speaking east of Ukraine, his first trip as president was to Brussels. That was quickly followed by a visit to Moscow, and another, and he seems to have hardly looked west since. Yanukovych made no bones he would look at extending the lease of the base, but it is a surprise to see a deal done so soon. 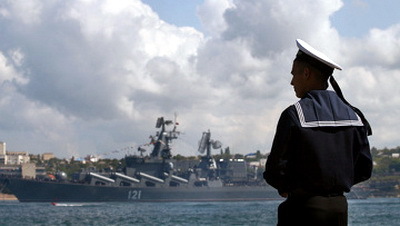 The continuing presence of the Black Sea Fleet in Crimea is the only significant thing Moscow wanted from Kiev. Russia has already started building Nord Stream, a gas pipeline straight to Germany under the Baltic Sea, and both Russia's South Stream and the European Nabucco projects would hope to be filled with gas that would otherwise be pumped via Ukraine, so the country's major role as a transit nation for Russian gas exports to Europe are undoubtedly numbered. The deal up until 2020 is perhaps the last card Kiev had to play. Ukraine's opposition argued the country's constitution excluded the deployment of foreign military bases on its territory, but the Constitutional Court has ruled the agreement legal, as it is not a new treaty but rather the extension of the current one. So parliament would seem to have the last word on the deal. Do the Ukrainian lawmakers think their president got enough when he signed the on the dotted line last week? We will have their answer soon enough.